Choppes always says “power of the mustache” which has absolutely no meaning. That’s probably why he follows that up with “spirits, chi, karma!” Definitely has no meaning. However, after months of believing in superstition and bad omens that exist in solo queue, Senor Choppes was able to successfully reach Gold II! Whenever he would try his qualifier games he would tell everyone not to spectate him or it would be bad luck. Well if I wouldn’t have spectated him I never would have had proof that he made it! Here’s the winning game that pushed him over his seven attempt slump! Congrats Jake! Normally I wouldn’t expect to have a season where I had a champion without a lost game. 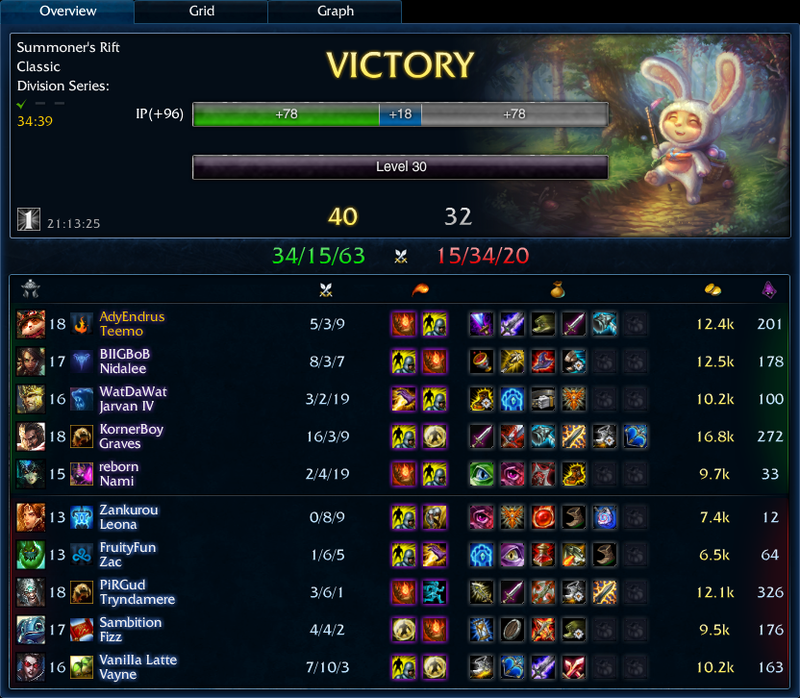 However, so far this season I am undefeated with Teemo. Of all the champions I play I have never felt like Teemo was my strongest. However, he is my go-to champion when I’m headed up into top lane. I like the vision that he gets from his mushrooms. I like his passive. I like that you can build whatever you want on him and he does just fine. This game I decided to try a different build and see where it took me. One of the strange things about my latest game was how my lane opponent acted. I picked Teemo because I felt like it would be a solid pick against Tryndamere. I was correct; he never even came to lane. He swapped Fizz for mid. I warded early because I’m a big believer in the ganking power of Zac. Zac still just jumped over the wall outside of my vision and, with the assistance of Fizz, killed me pretty quickly. I’ve always viewed Fizz as one of those champions who is easier to bully in lane, but if they get ahead they can snowball and just make you pay. Now that Fizz had a kill up on me I figure he would play aggro and force me out of lane. I was darting back and forth, not daring to get last hits because at any moment this Fizz could just kill me. However, this Fizz was playing like we were in Diamond. Instead of just playing aggro and trying to snowball the lane he was just calmly letting me farm and minding his own business. If I didn’t shoot him, he didn’t stab me. Now I have seen players play like this, and like just goes on and on. I remember a game where I was Mordekaiser against a Pantheon in top lane (that tells you how long ago it was) when I was able to walk PAST this Pantheon to last hit creeps and we would intentionally not harass or hit the other person. The game was insanely comical. However, if you are playing in solo queue and trying to climb and you get ahead, you should take full advantage and do what you can to keep that lead. I guess that’s just my opinion. I managed just fine in my lane. I would get bored of pushing Fizz into his tower so I would wander down and shroom up in the enemy jungle and in mid lane. It was extremely effective because the deeper I got my mushrooms the better the chance was that I would see Zac, and not only coming to my lane, but going to gank mid as well. Ultimately, I was a tiny furry creature on a large map. My impact in this game was extremely limited. I’ve considered running Teleport on Teemo because the ability to teleport to a mushroom seems extremely powerful at every stage of the game. However, instead of having that global presence I instead took Ignite so I can do better in trades with my lane opponent. One of the memorable parts of this game was watching from top lane as four members of the enemy team shoved down mid and killed three of my team mates, leaving only Graves and myself in top lane. We came walking backwards up mid lane, moving towards the safety of our purple base, but the four members of the enemy team were standing between us and salvation. I started to hesitate. Could we 2v4 these guys? I definitely wasn’t big yet, but my Graves had a couple items completed. I didn’t know how much he had left in the tank as him and I had just killed Tryndamere. The enemy team sees they have a numbers advantage and they have us trapped away from our base. The mistake they made was not committing to the fight all at once. They saw the low-hanging fruit of two easy kills and they each wanted to take full advantage of that. Graves killed them all. I popped Zac’s passive, but then let Graves get the last hit as I just laughed. This game was over. Graves finished at a whopping 16-3, more kills than the enemy team. I was just along for the ride. It was funny to watch one man just pick a whole team apart. Now I’m one game into my qualifier and that much closer to Gold III. This was my first experience with the new Master Yi. The game was more than long enough to get a taste of what he could become. One of the problems I foresaw at the start of this game is that if I’m playing Ezreal against a Tristana then I can win laning phase rather easily, but when the game goes late my Muramana and Iceborn Gauntlets don’t stand up to her Infinity Edge and Phantom Dancer combo. In all reality we didn’t deserve to win this game after it went this late, but Tristana was only five items and, due to the recent popularity of Blade of the Ruined King, didn’t have maximum damage output. 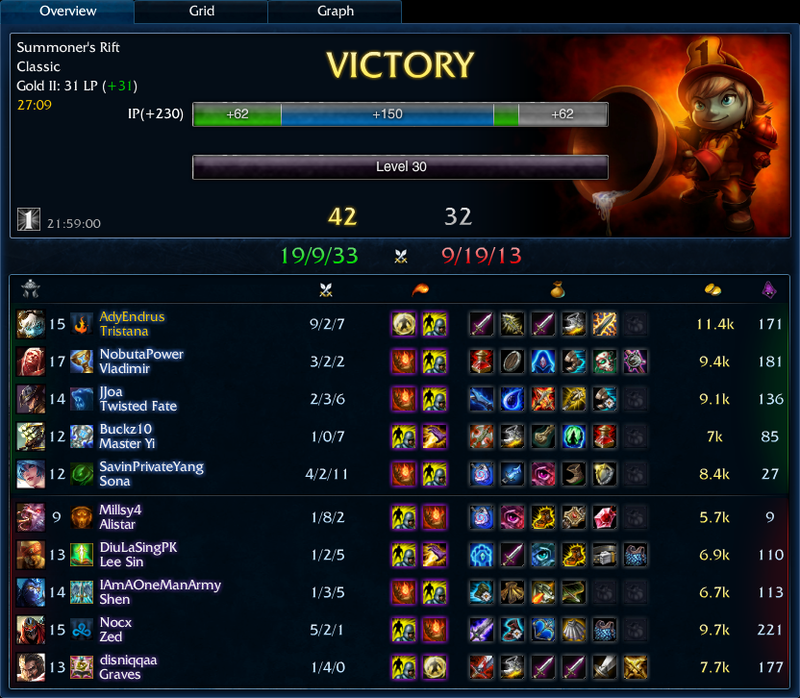 I felt like Tristana needed one good team fight to clean up late and then shove down a lane and win the game. Even though Tristana was never the one to clean up a team fight, we did lose a number of fights, but the enemy team wouldn’t just shove and win, they would dilly dally around and waste time. We deserved to lose this game more than once, and the enemy team didn’t check death timers, they just left, or avoided a 4v1 fight. At the end of the game my Master Yi noticed that I couldn’t go toe to toe with Tristana any more, but I could easily handle anyone else. In the best interest of his teammates he engaged the enemy team as they were standing outside of our base. As the dust settled I walked away with a double kill and Yi finished with a triple kill, and we sprinted down mid and ended the game. As a side note: Syndra was hitting like a truck. If she stunned me, she could DFG and press R and I would die. It was scary crap. I’m just glad we won! I needed a first win of the day and decided to just throw myself into the ranked queue. It’s slightly depressing that you have to accept matches like five or six times because people don’t accept. I guess it is better to have them drop at that point than during the game. Once I finally had a queue with nine other people willing to accept I was put into last pick. I knew what this meant, and started planning my supports accordingly. First pick just locked Hecarim without saying a word. Next two picks were Karma and Rumble, who wanted mid and top respectively. I had seen a lot of Karma play in higher elos who would play either mid or top, so I had to trust this guy. Later I saw that he didn’t have any Karma games in ranked. Whoops! When it came to the last two picks Caitlyn locked very quickly, but had Cleanse, which gave me hope. I picked Lulu after juggling a few thoughts on Alistar and Taric. The enemy team picked Taric last, which really surprised me. 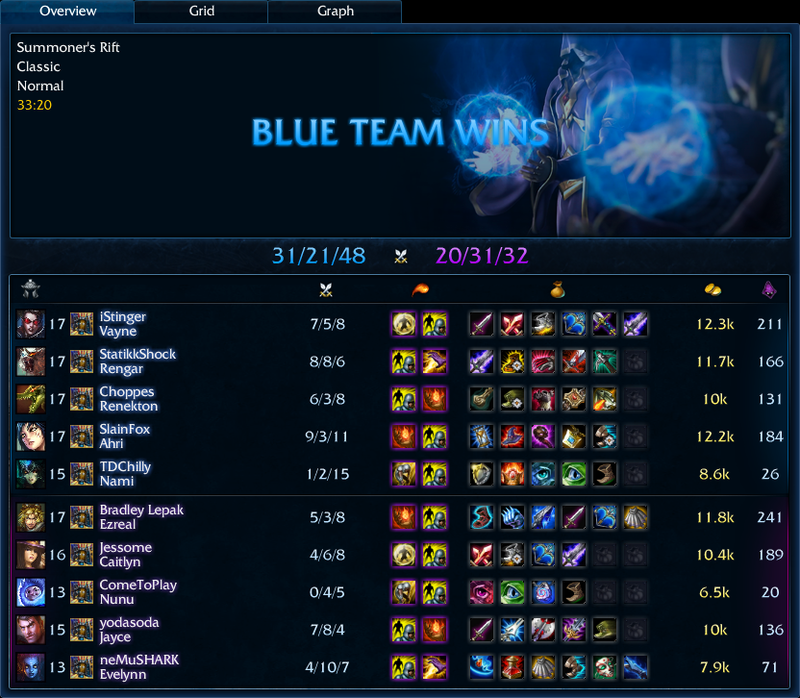 They already had a Nunu and a Shaco, so I was set on them running Nunu support. Maybe lane Shaco, jungle Taric? Solo top Taric, Nunu support? I had no idea. Solo top Nunu wrecked our Rumble so hard. Rumble started 0-4-0. We didn’t care. We picked up First Blood in bottom lane, and did it right as three huge creep waves got to the enemy turret. We immediately recalled so we could buy and get back to lane without missing much experience. When we got back to lane Caitlyn walked into the bushes and just started auto attacking non-stop. I caught on very quickly what had happened when I saw her miss CS and not move between autos. Caitlyn had disconnected. My mind went into panic. At least she was attacking, which made her seem alive and showed presence and would push the lane so that Varus and Taric didn’t move in closer. I walked in and stood next to her, fearful that she would get targeted by the enemies. After an agonizing wait Caitlyn finally started walking down the lane towards our base with the announcement of “A summoner has disconnected.” I felt like I was in the Hunger Games and the odds were ever in my favor. Or maybe it wasn’t the odds, maybe it was karma. Cait was gone for awhile, but I took the time to get some CS. I knew it wasn’t money wasted because I would need it the longer this game went on. I actually was surprised how well I last hit at tower. I probably had two or three waves come into tower range and I managed to get most of them. I had two points in both Glitter Lance and Help, Pix! so the damage was spread evenly enough that either could last hit for me. 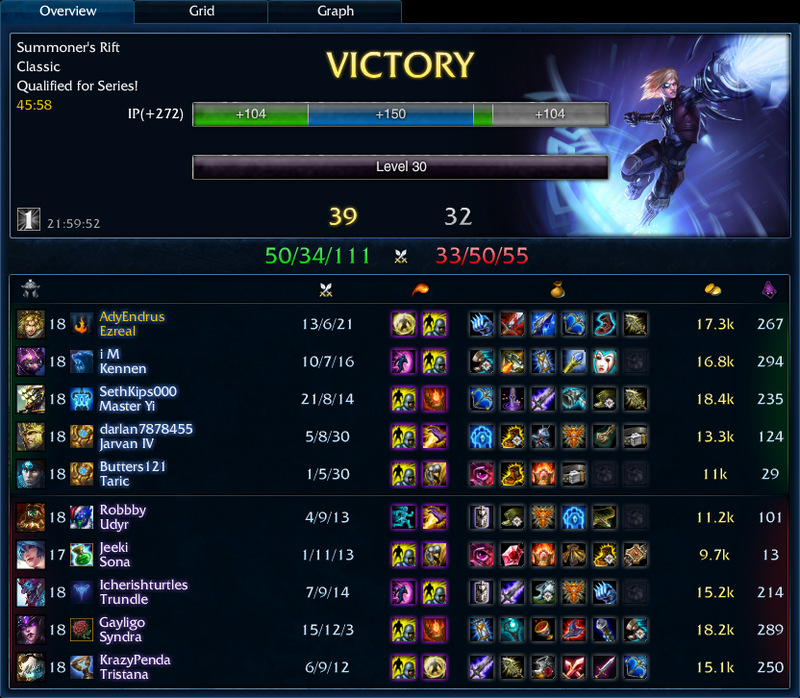 It worked well and I ended up getting 25-30 CS waiting for Caitlyn to come back. Caitlyn apologized when she reconnected, and came back to lane and we continued to do well. Shaco pressure was definitely a thing in our lane, and it held us back a little bit, but Shaco could only do so much. I was pulled top to rescue our failed top lane and ended up getting a kill on Shaco as the rest of the enemy team pushed mid. I recalled and let them know I was coming. I saw Cait get snagged by Lux and figured she was a goner. I honestly looked back at myself on the Nexus platform and started walking to defend the turret. No kill call out. Cait had used Cleanse, but wasn’t safe. I walked towards her as fast as I could. Varus had jumped into our base and was fighting with Caitlyn. When she was about to drop I popped my ultimate and Help, Pix! on her just in time to save her life. Then I simply wrote “hi” and we walked out of the base to chase down the rest of the enemy team. We were able to siege mid because Karma’s AoE heal was so massive that our whole team would get filled up rather quickly. The burst she was putting out was amazing. We stood in their base until the Nexus went down. Caitlyn and Karma got a lot of credit for kills this game. 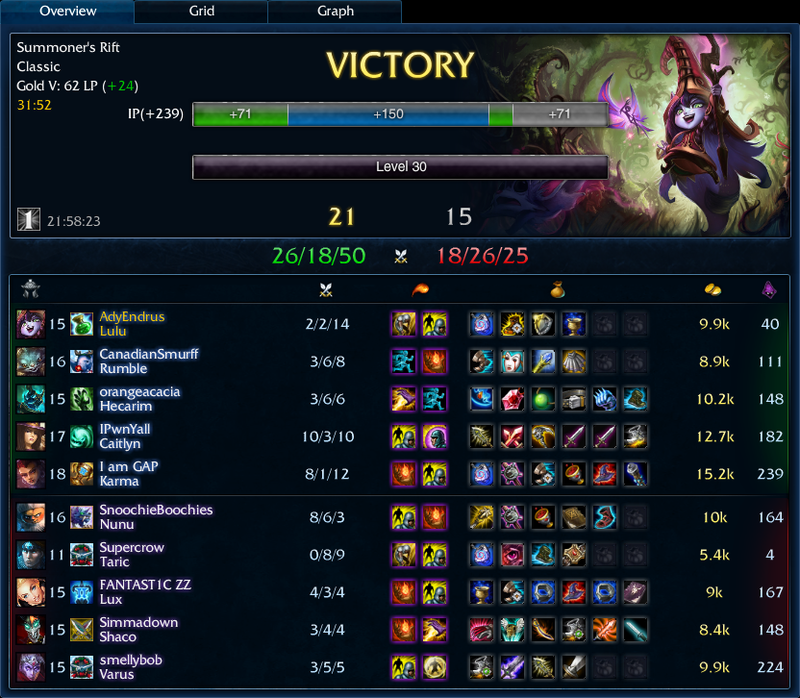 Before we moved onto Baron I had enough for Bulwark and three pink wards. I just never had to go back with Chalice and Karma heals. It probably would have really helped my team to let me use my Homeguard boots, but oh well. A win is a win, right? Ultimately, Karma carried.